I think computers have a lot to do with it. My handwriting has always been awful. My husband’s is gorgeous. Who writes personal notes anymore? As to signatures– just look at most physicians to see how handwriting has been allowed to deteriorate. Yes, I agree. But is there anything nicer than receiving a personal handwritten note from someone? How much better is that than a text message or email? Seriously! We need to keep that custom alive. Bad signatures are fine as long as they are unique and identifiable to an individual. Thanks for reading Lisa. I did not know this. Thanks for shining the light on this subject. I think we need to have a conversation about this. Aren’t all historical documents hand written? How will future generations be able to read them? You do have beautiful penmanship Pat, like your mother. Yes, re many of the historical documents and you are right, it will,present a problem. Imagine having to get a special translator to read cursive writing! How silly is that! We can only hope we come to our senses and realize the gap we are creating in the education system. As parents were we ever consulted or did this just happen? That’s a question I’d love to know the answer to. I agree Pat, Cursive Writing is becoming a lost skill. My grandson is in Grade 10 and finds it a chore to sign his name. He does everything on a tablet, cell phone and video game…..and often doesn’t use real or whole words to reply. It’s sad. I still enjoy writing hand written cards when the occasion arises, but do find it easier to type on a tablet, than to write on paper with a pen. Thanks Briit Girl…your grandson is like many children. I was just talking to my granddaughter who feels much like your grandson. But when I asked how she would write a cheque or get a passport, she didn’t know. Kids don’t really think much about life as an adult, but I expect more from the education system. its time for change. Just this week, I noticed that my own handwriting is deteriorating because I’ve not used it often enough since keyboards are used more often. After reading your thoughts on this, and fully agreeing with you, I’m going to make more of an effort to write every day. How sad that there may be a whole generation of people who won’t be able to read anything from our past. I’ve also noticed young adults who ‘write’ (print) by holding their pen much as a two year old holds a crayon, holding it clumsily in a fist instead of placed between their thumb and first two fingers. Perhaps they’re not even taught the best way to hold a writing instrument in school anymore since they don’t need as many fine motor skills to block print. It doesn’t look very business-like for an adult to drag a fist around when filling out a document, looks more like I’d imagine a cave man dragging a stick in the sand, lol… That’s what I think of every time it’s done, anyway. Sad, just sad. Yes, I agree, it’s much easier to write using our keypads. I don’t think we need to have children write all their work in longhand…just a basic understanding of how to hold a pen and write in cursive…for signing their name and writing or reading the odd note. Well said Mary…let’s hope we come to our senses. Thanks for reading. So well articulated. Handwriting in its basic form is personal artwork to be enjoyed and used for ourselves! I consider myself very technically savvy, however when it comes to writing out lists, instructions or ideas there is nothing better then getting my notebook and favourite pen (purple ink, BIC…I highly recommend this little gem) and going for it. Crossing things off a list, drawing diagrams and connecting thoughts together is all part of a process that gives us a sense of control and organization. Perhaps once carpal tunnel becomes a chronic disease, some genius will bring the old fashioned pen back with much fanfare, research and budget dollars attached. What a lovely note…thank you for your comment. I think the purple ink adds to an especially creative interlude between hand and heart. I also love crossing things off a list!! So therapeutic. Thanks Beth…it just seems like such a basic thing to know how to do. I guess it’s our generation in many ways, but still…how will the future generation survive without it. I just don’t get it! As a teacher, I, too, am alarmed at the loss of cursive, though my own handwriting is deplorable. Interesting, though, I had a sister-in-law who went to a progressive elementary school in the sixties who was only taught manuscript. She never learned cursive and has gone through life printing her signatures. She is now a professor at a major university who has published books and lectures world wide. So perhaps I needn’t worry about students learning cursive. Well, I’m glad you did as you were told. 😊 Does that mean you will take my double dog-dare and not use your signature or cursive writing for one month…and get back to me? Thanks for reading and for your comment. Thank you for stopping at my blog. 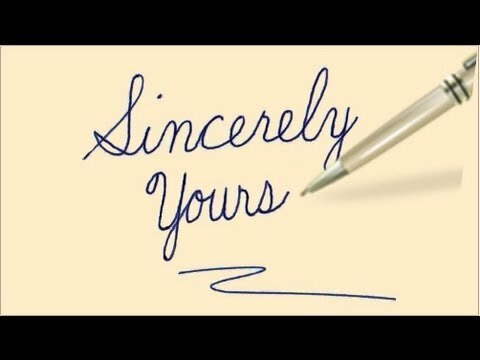 You are right about handwriting. Have to admit, though that my handwriting is the world’s worse. Thanks for reading. Bad hand writing and all, at least you can read cursive…a skill that is quickly becoming obsolete as well. What will the young people of today do down the road, when they want to read old letters and documents relevant to their family history? Hire an translator? Interesting phenomenon. I actually can’t remember the last time I signed something…and my signature has always had a somewhat legible K and a B and…squiggles. Nobody’s ever told me that wasn’t my name, so…. Uniquely you – my point exactly! 😀 I’m sure there is no other signature out there quite like yours.